This is part one of two posts offering TONS of great ideas to keep your kids entertained during summer vacation! It’s a huge list of kid friendly summer activities, most of which are FREE! Keep your kids occupied and entertained this summer with just a little planning. 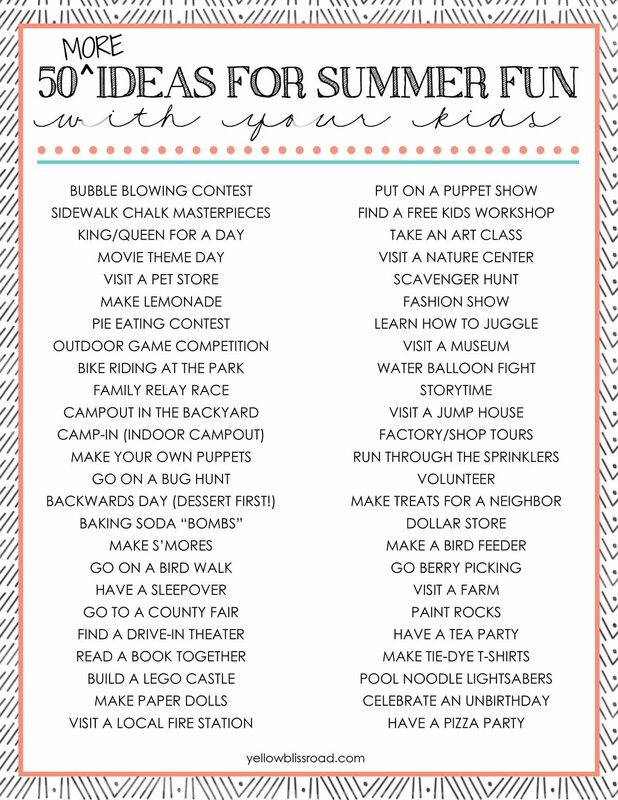 Here is a list of 50 MORE ideas for summer fun with your kids! Be sure to check out the first 50 Fun Summer Activities for Kids! The above graphic is also a free printable. Print this list out by clicking on the image, then right click and save to your computer. BUBBLE BLOWING CONTEST – Get some bubbles at the dollar store, or make your own bubbles. SIDEWALK CHALK MASTERPIECES – Draw some frames out on the ground, and let your kids go to town creating some fabulous artwork. Be sure to take pictures! KING/QUEEN FOR A DAY – Let each of your kids be in charge for a day. They pick the food you eat, the games you play, the shows you watch, etc. If you’re really brave you can even let them pick out your clothes! MOVIE THEME DAY – Dress/talk/act like your favorite movie character, and plan the day around your favorite movies. MAKE LEMONADE – Here’s a great recipe: Easy Homemade Lemonade; And some fun lemonade stand printables. OUTDOOR GAME COMPETITION – Plan one for your family or consider including friends. CAMP-IN (INDOOR CAMPOUT) – Get out the sleeping bags and blankets and have a campout on the living room floor! GO ON A BIRD WALK – Make some binoculars out of toilet paper rolls and head out on a nature walk to see how many different types of birds you can spot. GO TO A COUNTY FAIR – Check this website to find a county fair near you. FIND A DRIVE-IN THEATER – find one here. READ A BOOK TOGETHER – Find a great chapter book and read aloud to your kids each night before bed. FIND A FREE KIDS WORKSHOP – Lowe’s Build & Grow;Home Depot Kids Worshops; Toys R Us, Michaels, The Lego Store, and Pottery Barn Kids all offer free workshops and events each month. Check with your local stores to see what’s available. VISIT A NATURE CENTER – Find a nature center near you. VISIT A MUSEUM – Bank of America card holders get free admission on the first Sunday of the month. STORYTIME – Go to storytime at your local library or bookstore. Barnes & Noble offers bedtime stories, as does Pottery Barn Kids. VISIT A JUMP HOUSE – This is a little more costly, but it’s a great way to burn off some energy while mom sits in the air conditioning while kids play! Some stores offer discounts for larger groups or for certain times of the day/month. FACTORY/SHOP TOURS – Check with local factories, stores or restaurants. Many offer tours of their facilities! VOLUNTEER – VolunteerMatch.org will help you find a place to volunteer with your kids. DOLLAR STORE – Give your kids each a dollar for good behavior or completing a chore and take them to the dollar store or the Target dollar spot and let them spend it on something silly. MAKE A BIRD FEEDER – Here are 20 Unique Birdfeeders to try. MAKE TIE-DIE T-SHIRTS – Here’s an easy how-to. POOL NOODLE LIGHTSABERS – Here’s an easy how-to. CELEBRATE AN UNBIRTHDAY – Bake a cake, hang decorations and plan a special dinner for the unbirthday person! HAVE A PIZZA PARTY – Here are some great ideas for an easy family pizza party. Whew, that was a lot! I’m pretty excited for summer now, and I hope you are too! How do you keep your kids entertained over the summer? 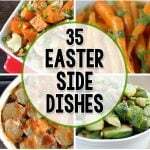 Do you have ideas that aren’t on this list? Leave them in the comments – I’d love some more great suggestions. I’m working on a free printable black list as well, so you can write your own and check off each activity as you complete it. Watch for that one next week! For those long car rides, get some kids’ podcasts! There is a new “Highlights Hangout” podcast that is fantastic.